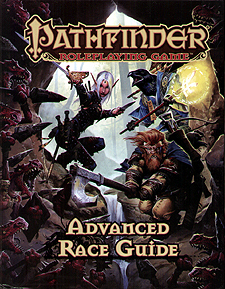 The Pathfinder RPG Advanced Race Guide is a hold new companion to the Pathfinder RPG Core Rulebook. This imaginative tabletop game builds on more than 10 years of system development and an Open Playtest featuring more than 50,000 gamers to create a cutting-edge RPG experience that brings the all-time best-selling set of fantasy rules into the new millennium. 30 exotic races, from mischievous goblins and reptilian kobolds to crow-headed tengus and deadly row, each with complete rules for use as player characters, plus archetypes, alternative racial traits, and other options for maximum customization. Tons of new race-specific equipment, feats, spells, and magic items for each of the races detailed.